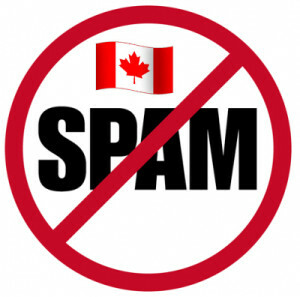 Do you like receiving email spam? Of course, not. Then make sure you are not sending spam. The new Canadian Anti Spam Legislation is being approved in July of this year, and you’ll want to make sure you comply with the rules, to avoid hefty million dollar fines. I’ve compiled a list of the basic things you need to know and things you can do right away. Here goes. In order to send a CEM, you must comply with three components. Permission – You must clearly describe the purpose for why you are asking for permission. Consent can be either ‘expressed’ or ‘implied’. Sender information – you need to have your name, company name, and physical address in the body. You also need to provide a way to contact you, either a phone number, email address, or website. Unsubscribe Function – There must be an option to unsubscribe or opt out of future mailing. The legislation describes permission as being expressed or implied. Here’s a break down. This means you have specifically asked for permission to send information, and someone has willingly agreed. – On your website, someone provides their email address as permission to send them information. – On paper, someone has explicitly provided their email address with the expectation of receiving more information. Expressed permission is the preferred, and long-term approach to permission-based marketing. This is where it gets gray. Implied means that you have an existing business relationship, and are therefore permitted to send a contact a CEM. This implied consent will only be valid for a period of two years, at which time you will have to reconfirm that person’s permission. Start reconfirming all your contacts starting today to get their expressed permission, so that you don’t have the burden of sorting all this out later. Use expressed consent as your best practice. If you are collecting names in your store or office, or by phone, you need to keep a list indicating that is how you received consent. If someone is signing up to a form on your website, your email client (e.g. MailChimp, Constant Contact, or Aweber) handles the permission aspect for you. However, if you are loading a spreadsheet list into one of those services, you better have expressed consent itemized somewhere. I’ve listened to a few webinars regarding the law, and its interpretation. As I’ve mentioned, there are still a few gray areas. Instead of trying to see if what you are doing is legal, I suggest just shifting your processes to make sure you are always getting expressed consent before you send out your newsletters, or commercial emails. If I can help you clarify what you are doing, or help you get your newsletter set up, or rejuvenated, please contact me to start a conversation.